French officials have confirmed 84 dead and 202 injured in last night’s horrific truck attack into crowds celebrating Bastille Day in Nice, France, reports the Associated Press. Here’s everything we know about the horrific crash, the driver, and the aftermath. 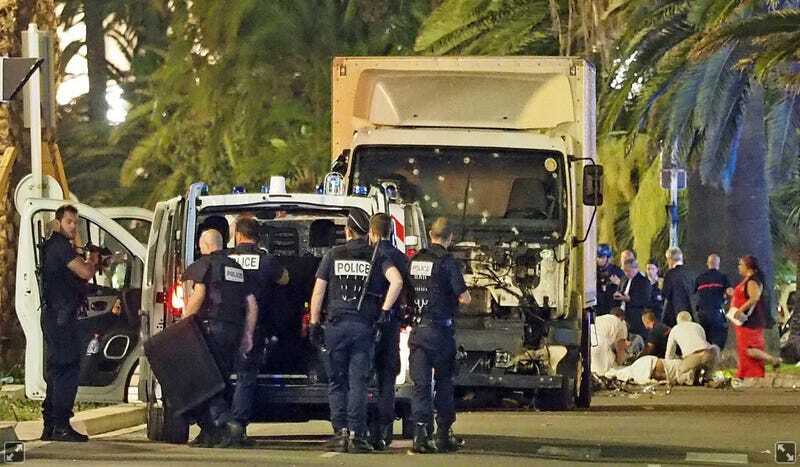 Around 10:30 p.m. CEST last night, Bouhlel drove a truck into crowds along the Promenade des Anglais for approximately 45 seconds, reports Time. Bouhlel had rented the truck on Wednesday, according to a tweet by local publication Nice-Matin. Eyewitnesses say Bouhlel opened fire on the crowd as well. Bouhlel’s rampage ended in a shootout with police. Of the 202 injured, a Paris prosecutor confirmed that 52 remain in critical condition, including 25 on life support. Driver Mohamed Lahouaiej Bouhlel was identified as the attacker by the office of the mayor of Nice, per MSNBC and he was killed by police at the scene last night. It remains unknown as to whether Bouhlel acted alone in the attack. Bouhlel’s motives also remain unclear. Bouhlel was a 31-year-old Tunisian national who lived in France. He lived in the relatively poor Route de Turin district east of downtown Nice. One neighbor described him as “not normal” and “always alone” to Reuters. Bouhlel had prior run-ins with local police for assault and theft, however, a prosecutor told Time that he was not being monitored by any intelligence agencies. Bouhlel left behind a wife and children. Police arrested Bouhlel’s wife early Friday, where she is being questioned by authorities. While no group has come forward to take responsibility for the attack, Islamic State militants have been praising Bouhlel’s tactics, reports Vocativ. While it is unknown as to whether Bouhlel has any connection to the Islamic State group, supporters of the terrorist group are celebrating the attack as revenge for the death of Islamic State military advisor Abu Omar al-Shishani online. If you are not able to find an IED or a bullet, then single out the disbelieving American, Frenchman or any of their allies. Smash his head with a rock, or slaughter him with a knife, or run him over with your car. The nature of the truck attack prompted Interpol to send an Incident Response Team to assist with investigations, per an agency statement. The team includes victim identification experts, plus terrorism and information specialists. Nice has remained on high alert ever since the attack. A suspicious package left in the airport caused an evacuation there, however, MSNBC reports that it was a false alarm. This morning, police also found a suspicious package in the attacker’s neighborhood, prompting bomb disposal experts to perform a controlled explosion of the package. Two nearby apartments were evacuated. A Volvo truck and an apartment were also searched. Two other events have been cancelled in the wake of the attacks: a Rihanna concert and the Nice Jazz Festival. Why Nice? Because it is known all over the world, it is one of the most beautiful cities in the world. Why July 14? Because it is a celebration of liberty. President Hollande flew to Nice today to visit the hospital and meet with local officials. Two Americans—father Sean Copeland and his son Brodie from Lakeway, Tex.—were also killed in the attack, per the Austin American-Statesman. Other victims include citizens of Morocco, Russia, Switzerland and Armenia, per Time. Correction: An earlier report made by MSNBC said that Bouhlel was a French citizen of Tunisian descent, however, numerous other reports as well as a later version of MSNBC’s story confirm that he was actually a Tunisian national living in France. Our apologies for the confusion.